Bottom line: Learn 3 different ways to copy and paste cells or ranges in Excel with VBA Macros. This is a 3-part video series and you can also download the file that contains the code. Copy and paste is probably one of the most common actions you take in Excel. It's also one of the most common tasks we automate when writing macros. There are a few different ways to accomplish this task, and the macro recorder doesn't always give you the most efficient VBA code. The most efficient method for a simple copy and paste in VBA. The easiest way to paste values. How to use the PasteSpecial method for other paste types. You can download the file I use in these videos below. The code is also available at the bottom of the page. You can watch the playlist that includes all 3 videos at the top of this page. Download the workbook that contains the code. One of the most common questions I get about copying and pasting with VBA is, how do I paste to the bottom of a range that is constantly changing? I first want to find the last row of data, then copy & paste below it. 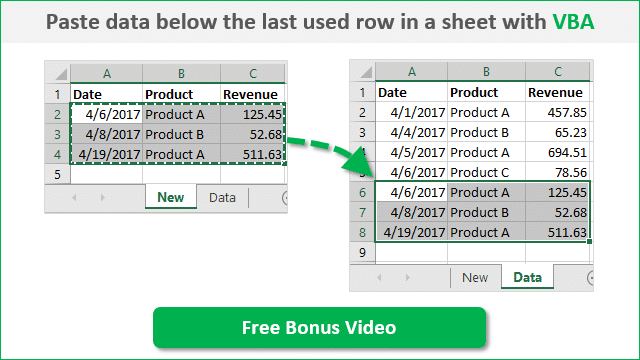 To answer this question, I created a free training video on how to paste data below the last used row in a sheet with VBA. Can I send you the video? Please click the image below to get the video. The 3 videos above are from my VBA Pro Course. If you want to learn more about macros and VBA then checkout my free 3-part video training series. I will also send you info on the VBA Pro Course, that will take you from beginner to expert. Click the link below to get instant access. I have a crunched data in one workbook and wanted paste it in other by using macro. Also the number of line items changes every day (increase or decrease), So help me to copy and pasting the data in main template without number mismatch. I need your support, I’m creating a workbook for daily report, and I’m stuck in the summary worksheet, in the VBA I don’t know how to link the information of the new report to be copied in the summary. I even want the command to open the worksheet from a directory too. Do you have any suggestions on how to do this? Hope to hear from you. Many thanks. Do you have any suggestions on how to do this? you need to take work under one variable than activate the workbook and select particular sheet. You have to write code to copy paste in active workbook if you have any specific sheet than write sheet name.